I had the good fortune to attend much if not all of the Flaherty Seminar here at Colgate last week! I’m still working through what I found to be a quite intense experience in emails and conversations. Here is yet another version of my thoughts on the films seen and debates had. The theme of the seminar this year was “Open Wounds.” It’s one of those wonderful, vaguely specific phrases for which film programmers (myself included) are perpetually searching in an effort to give film viewers an architecture to use without locking them in and throwing away the key. Literal and metaphorical open wounds were certainly addressed in the content of many of the films programmed. Susana de Sousa Dias’ 48 (2009, 93 minutes) was exemplary in this respect. The film is a series of mug shots (fifteen?) of political prisoners taken during the Salazar regime. These indexes are the basis for a memory testimonial given by each person photographed on the film’s soundtrack. We never see the (now elderly) former political prisoner; we only hear his or her voice, which is both inside of and reflexively removed from the still black and white photograph. Dias’ documentary worked its film-temporal magic on me: I was really irritated with its inexorable slowness for the first fifteen minutes, but then my thoughts and my breathing seemed to meet the sound and images in front of me. I became totally engrossed in the incomplete stories told, and wakefully fascinated with these portraits of endurance and recalcitrance. The former prisoners spoke of their physical suffering and their mental trauma from neither the standpoint of victims or victors, but from the standpoint of resistants. Whether they were caught while actively sabotaging the regime or unluckily found themselves in the wrong place at the wrong time, they all had the political inscribed on their bodies and minds, perhaps in a way similar to the inscription of mileage and speed on a marathon runner. Dias’ expanding project of films (all dedicated to this history and originating in these police photographs) seemed in many respects to be a mediated, one-woman Truth and Reconciliation Commission for Portugal and its dictatorial history. 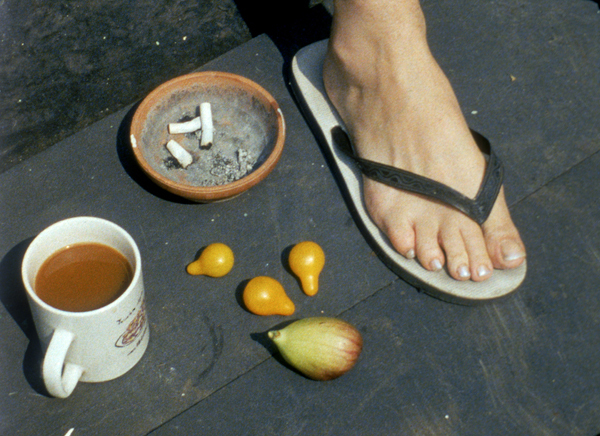 If the narrative of Dias’ films addressed the open wounds of national history, Su Friedrich’s wonderful Odds of Recovery (2002, 65 minutes) meditated on the pleasures and terrors of our bodies, the way they evolve sometimes in- and sometimes out-of-synch with the evolution of our interpersonal relationships and our spirit. As always, Friedrich’s masterful editing allowed the film to be unsentimental, witty, joyful, frustrating and moving at the same time. I appreciated the way each shot explicitly avoided conventional beauty. The biggest delight for me was the way in which Friedrich’s meandering, handheld tracking shots of vines and plants in her garden enlivened the embroidery she made of her surgeries (as work in progress as well as finished artwork). And vice versa. With these passages, the film became a kind of carte du tendre in moving images, moving back and forth between natural and interior worlds. This entry was posted in at the cinema and tagged Flaherty Seminar 2012, Su Friedrich, Susana de Sousa Dias by Jennifer Stob. Bookmark the permalink.